FOR VIEWING, THE WEBSITE IS ALLOWED TO COLLECT AND STORE DATA AND INFORMATION FOR THE PURPOSE OF EXCLUSION AND FOR MANY OTHER USES. The website and its contents are owned or licensed by the website. Material contained on the website must be presumed to be proprietary and copyrighted. Visitors have no rights whatsoever in the site content. Use of website content for any reason is unlawful unless it is done with express contract or permission of the website. You hereby agree to liquidated damages of US$100,000.00 plus costs and actual damages for violating this provision. This site is for informational and educational purposes only. The information should not be used for diagnosing or treating a health problem. The creators and content providers disclaim any liability or loss in connection with the information and advice provided here. This site offers health, fitness, medical and nutritional information and is designed for educational purposes only. You should not rely on this information as a substitute for, nor does it replace, professional medical advice, diagnosis, or treatment. If you have any concerns or questions about your health, you should always consult with a physician or other health-care professional. Do not disregard, avoid or delay obtaining medical or health related advice from your health-care professional because of something you may have read on this site. 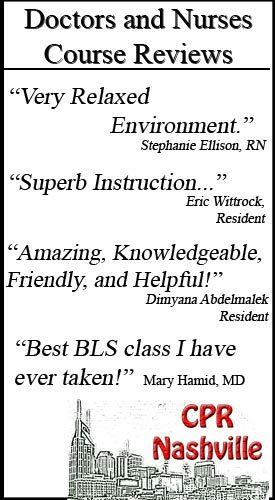 We also accept no responsibility for any circumstances in which a graduate of our course provides negligent health services to a patient or anyone provided with medical attention. 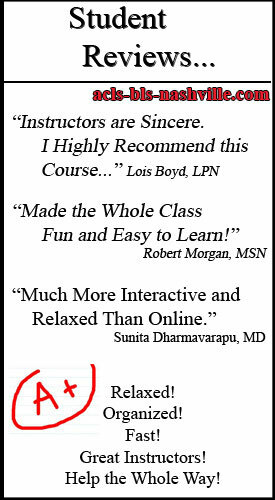 By purchasing our certification or recertification course you agree that you take full responsibility for your actions and for how you implement any and all knowledge gained from our course. 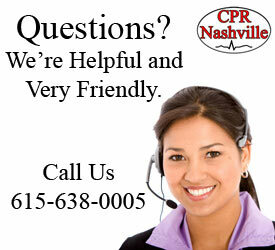 You also agree that you hold no liability to CPR Nashville, LLC, its owners, this website or the owners of this website whatsoever. 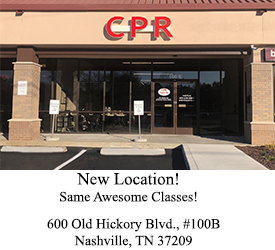 You also agree to relinquish any responsibility for loss of life or injury to any living thing or person that may result from your practice of the knowledge provided in our certification or recertification course. 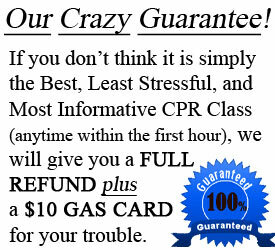 In addition, we are not responsible if you fail to recertify your card and your certification expires. We send reminders only as a courtesy, and in no way guarantee that these will reach you. You are solely responsible for keeping all your certifications up to date. The website disclaims any responsibility for the accuracy of the content of this website. Visitors assume all the risk of viewing, reading, using, or relying upon this information. Unless you have otherwise formed an express contract to the contrary with the website, you have no right to rely on any information contained herein as accurate. Posts on this site may contain affiliate links. That means if you buy something from them we may get paid an affiliate commission. Visitor downloads information from this site at this own risk. Website makes no warranty that downloads are free of corrupting computer codes, including, but not limited to, viruses and worms. downloads, and as a condition of the website to allow his lawful viewing, Visitor forever waives all right to claims of damage of any and all description based on any causal factor resulting in any possible harm, no matter how heinous or extensive, whether physical or emotional, foreseeable or unforeseeable, whether personal or business in nature. Arbitration shall be conducted pursuant to the rules of the American Arbitration Association which are in effect on the date a dispute is submitted to the American Arbitration Association. Information about the American Arbitration Association, its rules, and its forms are available from the American Arbitration Association, 335 Madison Avenue, Floor 10, New York, New York, 10017-4605. Hearing will take place in the city or county of the Seller which is St. Louis, MO. St. Louis County, St. Louis, MO.